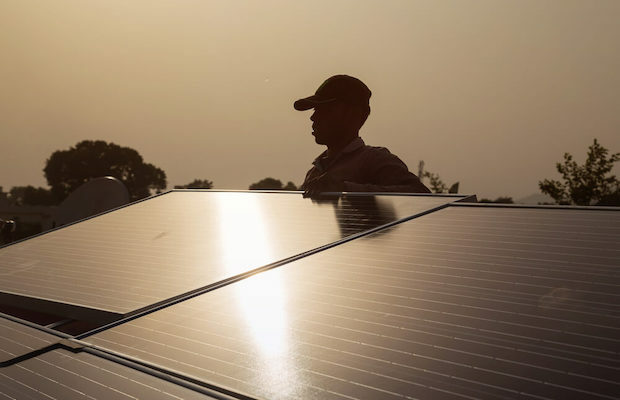 A village in Uttar Pradesh’s Amroha district is presenting itself as a model for renewable energy usage with complete dependence on solar power for all its needs. The solar-powered village in Chakanwala Panchayat named ‘Mandironwala Bhuddi’ has no electricity poles but is completely lit up using solar power. Solar panels have been installed at every house in the village as part of government’s scheme. “This area was surrounded by the Ganges and we thought of utilising the power of the river. We have installed solar panels all across the area to make the lives of people easy. We will soon start working on the project pertaining to road connectivity,” Kanwar Singh Tanwar, MP for Amroha told ANI. A couple of villagers also talked about how solar power has helped to bring brightness into their area. Imarti, a village resident said, “This is very beneficial to us as we can do our household chores easily in the solar light.” She also said that she will be casting her vote in the impending elections and expects that the government must work towards road connectivity and development of the village. The children of the village can be seen using the solar-powered lights to study in groups during night hours. Solar panels have been installed at every house in the village as part of government’s scheme. In January, Charigharia village, located inside the Bhitarkanika National Park (BNP) in Gupti gram panchayat under Rajnagar block in Odisha, under a new initiative by the Odisha Renewable Energy Development Agency (OREDA), was getting electricity from off-grid solar power systems for all 106 households. The government provided solar energy to the families of Charigharia under the Deen Dayal Upadhaya Grameen Jyoti Yojana (DDUGJY) with the Centre’s help. OREDA would maintain each household’s solar cells for five years. The agency installed three LED bulbs (5 watts), a tube light (18 watts), a solar fan (30 watts) and a mobile phone charger in all homes. Each house has a 200 watts solar module and battery which costs nearly Rs 65,000.